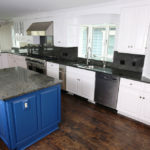 N-Hance, the fastest-growing wood refinishing franchise in the nation, will be featured on the premier season of TLC’s Make This Place Your Home with hosts Jackie Zeman (Nurse Bobbie Spencer from the daytime soap opera hit General Hospital) and Jaime Laurita (Rock & Roll Chef and kitchen designer to the stars). Make This Place Your Home is a half-hour home makeover program that highlights unique situations faced by homeowners, both old and new, and helps find creative ways to make the place in which they live truly feel like their home. Each episode demonstrates to the audience innovative and creative ways that will motivate and excite home builders, home owners and first-time home buyers on how to make their place a home. In this episode, the N-Hance team is brought in to assist homeowners Anna and Chris Reed, who recently purchased a house Jacksonville, Florida, where Chris plays for the NFL’s Jacksonville Jaguars. Adjusting to their new space, Anna was seeking to update the kitchen to better match the couple’s modern rustic style and give it an overall refresh. She turned to N-Hance for its exceptional customer service to get the job done. 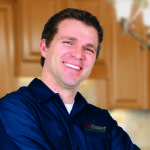 N-Hance Wood Refinishing is an innovative, affordable cabinet and floor renewal service that renews your wood cabinets and floors without the inconvenience associated with traditional refinishing. Plus it provides a much higher quality and durability than painting methods. 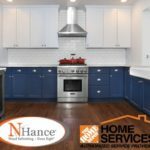 N-Hance can help with any wood refinishing need: cabinets, hardwood floors, exterior and interior doors, built-ins, stairs and railings, moldings and trim, furniture. N-Hance uses proprietary solutions and refinishing techniques to restore the natural beauty or change the color completely of hardwood floors, cabinets, doors and trims — at a more affordable cost than traditional remodels and a much better quality and durability than just painting the surfaces. With more than 500 franchises nationwide, the company is projected to close 2018 with the addition of 85 new units as it continues to expand its footprint nationwide.